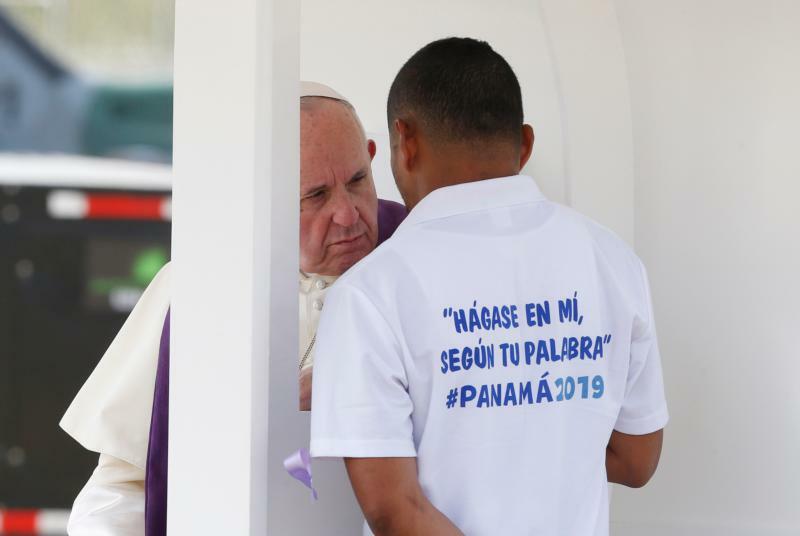 PANAMA CITY (CNS) — Just like the Pharisees, many today shun Jesus’ merciful love toward sinners and prefer to use labels that stigmatize a person’s past, present and future, Pope Francis said. Speaking to young detainees at a penitential liturgy in Las Garzas de Pacora Juvenile Detention Center in Panama Jan. 25, the pope said society creates “an adjective culture” that prefers to immediately label people as good or bad rather than truly getting to know them. “Gossipers are not interested (in the person). They quickly seek to put a label to get them out of the way. The adjective culture belittles the person,” he said. The detainees — wearing white World Youth Day T-shirts – chanted “Esta es la juventud del papa” (“We are the pope’s youths.”) Many wore rosaries around their necks or held them in their hands. “I would like to thank you because, as a servant of the Lord Jesus, you took the time to listen to a poor person deprived of freedom like myself. There are no words to describe the freedom I feel at this moment. Thank you for that,” he said. During the penitential liturgy, the pope heard the confessions of five inmates — four young men and a young woman — in a small tent set up outside of the prison, the Vatican said. One of the young men was missing a leg and using crutches. He could not sit down, so the pope stood up to hear his confession. “Jesus is not afraid to approach those who, for countless reasons, were the object of social hatred, like the publicans — we know that tax collectors grew rich by exploiting their own people and they caused great resentment — or like those who were called sinners because of the gravity of their faults, errors and mistakes,” the pope said. This love “has no time for complaining” and “initiates a process capable of providing ways and means for integration and transformation, healing and forgiveness: a path of salvation,” he said. Through this approach, Christ also breaks the insidious whispers that haunt those who repent from their sin, that continue to tell them “You can’t do it,” which instills in them fear that they will never change, Pope Francis said. “What the pope did today for our kids was spiritually great. It was what they needed: that he would remember that there are young people who had broken the law, who deserved that he would look at them and tell them, ‘I am here,'” Alba said.